We style your pet. We provide grooming for cats and dogs at our parlour in Gurgaon. We have professional and experienced groomers to provide best services. Vizal, the PetSpot owner, is a well-known groomer in India. 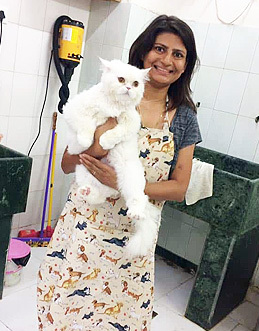 She is passionate about grooming pets and self-learned grooming when she was grooming her Lhasa Apso, Jumbo, for Kennel Club of India dog shows. In time to come, she visited Thailand and worked as assistant groomer with Mr. Theerasak Saengmuang. Mr. Saengmuang is well recognised groomer and owner of world’s one of the best known Pomeranians. During her stay in Thailand she learnt to groom many other breeds. PetSpot specialize in daily grooming as well as dog show grooming. Vizal has trained a team of groomers under her, for regular grooming sessions. We have been grooming dogs and cats since 2009. Please call us and book appointment on +91-9811133950 before bringing your pet to the parlour. This will help us to reduce your waiting time and provide more time & attention to the pet.